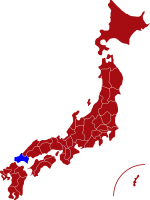 Yamaguchi prefecture, situated on the westernmost point of Honshu island, is a coastal region of Japan that fuses both bustling port towns and areas of rich cultural heritage. The prefecture’s capital, Yamaguchi city (often called the “Kyoto of the West”), is home to a number of fascinating attractions including Rurikō-ji temple’s stunning Five-Storied-Pagoda, and the Xavier Memorial Church which commemorates the travels of Saint Francis Xavier and the introduction of Christianity to Japan in the 16th century. 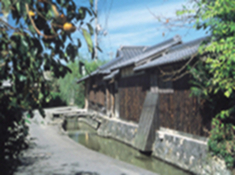 The castle town of Hagi is an area that consciously preserves the Samurai culture of the Edo period whilst the prefecture’s largest city, Shimonoseki, offers many unique attractions from the Tsunoshima Bridge and its beautiful oceanic views to the Karato sea market which specializes in the prefecture’s signature delicacy Fugu (blowfish). Shimonoseki also connects to Japan’s southern island of Kyushu via the Kanmon Bridge and opens up new possibilities for travelling and exploring the country. For more information about Yamaguchi prefecture, see their official tourism website. Air - Yamaguchi Ube Airport is located about 40 minutes from the city centre and is easily accessible by train or bus. The aiport operates regular flights to and from Tokyo's Haneda airport and the flight time is just 95 minutes. Click here for its website. 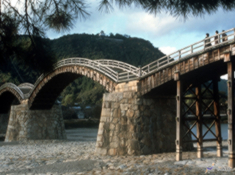 Kintaikyo Bridge is an incredible five-arched wooden bridge built over the Nishiki River in 1673. Deemed a national treasure, it is a site of both architectural ingenuity and historical relevance and is as beautiful at night as it is during the day. 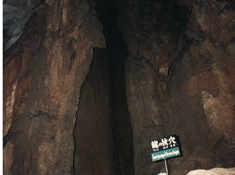 Akiyoshidai Quasi-National Park - Located less than an hour’s drive from Yamaguchi City, the park’s main attraction is the Akiyoshidō, Japan’s largest and longest cave. A mile of this geological wonder is accessible to the public and a "must-visit" attraction for vistors to Yamaguchi prefecture. Hagi's Old Castle Town is one of the finest examples of a traditional Castle Town and has managed to carefully preserve many wonderful original features of a bygone era. 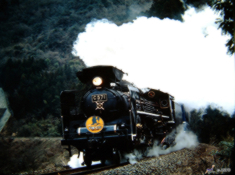 SL Yamaguchi also affectionally known as C571, has attracted popularity by its nickname “Fair Lady.” It runs between Shin-Yamaguchi Station, a gateway of Yamaguchi Prefecture and Tsuwano Station.